We have purposely left the Gigabyte NP106D5-6G running for almost three months in not that great conditions for mining, without cleaning the dust getting accumulated and with the GPU running a bit hotter than we consider optimal at around 50 degrees Celsius. Of course we did not use extreme conditions here like a very dusty environment and high temperature, even though some people do run miners in such conditions and not care about the possible problems they can have with the hardware running 24/7 for long period of time under heavy load. 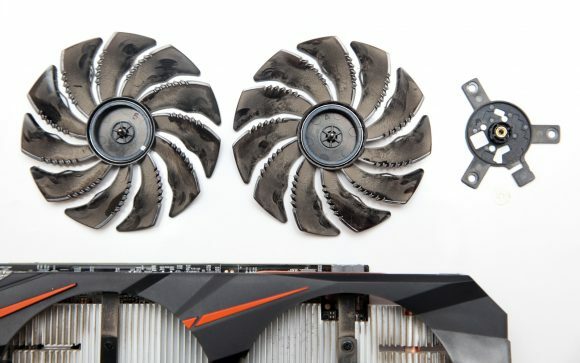 The good news is that even though there have been a bit of dust buildup on the whole video card, the fans did not show any sign of degrading in terms of cooling performance. So the good news is that they will not fail before the warranty of 3 months will run out (most likely), good job Gigabyte, but since these are mining GPUs they will need to work much more than just 3 months. We actually had issues with some Gigabyte fans on some AMD Radeon RX 400/500 series starting to have issues in just about 3-4 weeks, though most usually do continue working fine for longer periods of time. However we have seen some signs that are giving up early warnings that in 3rd to 6th month of operation if the fans are not maintained they could start degrading and ultimately failing at some point after that. There was almost no dust particles found inside the sleeve bearing after disassembling the fans to check them, however the lubricant that was plentiful when the GPU was brand new was almost completely evaporated in a bit less than just 3 months of use. Once the lubricant evaporates the performance of the fan starts degrading and things can start failing once the sleeve bearing starts to get damaged and clogged with dust. This is precisely why sleeve bearing fans are not that good for mining, so if you have video cards that you use for mining that have sleeve bearings you need to take more care for them. They need to be cleaned from dust more often and it is a good idea to lubricate them every few months in order to extend their life. This is especially important for mining video cards with limited warranty where you cannot just replace a card because of a failed fan after the 3 months warranty of these GPUs passes. Our advice is to go for GPUs with ball bearing fans when possible when you are building mining rigs and not for ones with sleeve bearings. Ball bearing fans do tend to have larger life and be more durable especially under higher operating temperatures when compared to sleeve bearings. The higher the operating temperature, the lower the reliability and durability of the sleeve bearing fans will be and we all know that with mining we have constantly higher operating temperatures. 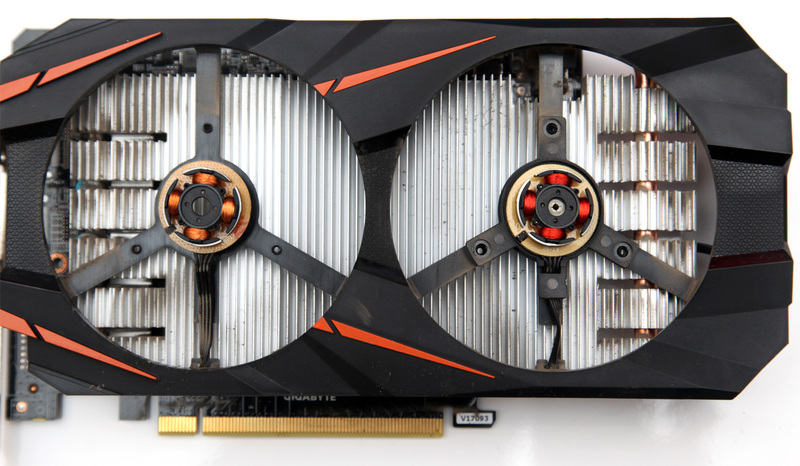 In both cases however regular maintenance can and will help you get longer life of the fans without trouble. 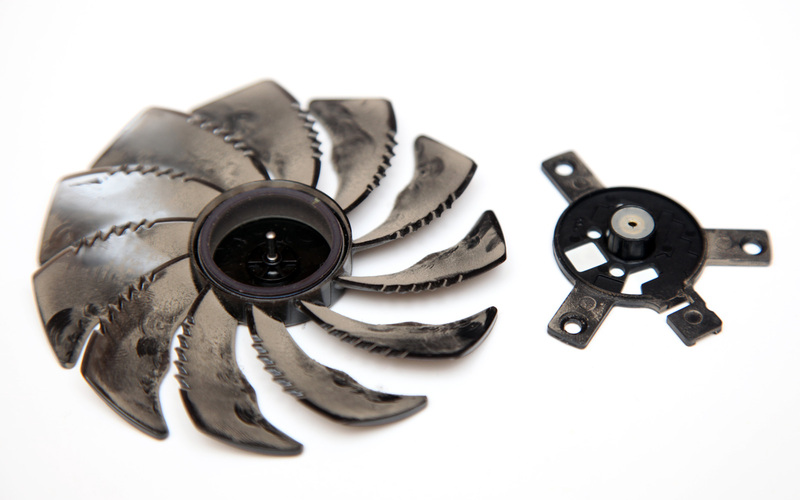 If you are already past the point of having sleeve bearing fans operate at their best or they are even starting to fail, then you might want to check our guide on how to repair non-serviceable GPU fans. In it we cover how to disassemble sleeve bearing fans and remove the metal bushing and replace it with ball bearings in order to bring back to life and extend the operating time of the fans (if it is not too late to revive them). The whole problem with ball bearing fans is that they are just more expensive than sleeve bearings and yet even on high-end and very expensive GPUs we can still find companies using sleeve bearings for their fans, so what is left for cheaper ones and especially models where the manufacturer is looking to save on costs like with some of the mining GPUs.